We bleach using Daly’s A & B Bleach, which is available via their Web site. The task before us, wetting down and then keeping the wood wet for at least 16 hours is daunting to be sure. Where 3” chip brushes usually suffice, we needed heavier artillery for this job, so I turned to a 12” 2/3” nap paint roller. Even then, and especially on the topsides and transom, I found myself circling back continuously as the mahogany soaked up the bleach and seemed to be drying. Once John and RJ were able to join the fun, we became somewhat like a train with me using my roller, which applied copious amounts of bleach to the wood, and the guys following up with their trusty chip brushes. We always take great care to begin bleaching at the waterline and working to the gunwales, followed by the covering boards and finally the decks. Why? Soaking the wood is the goal, and beginning at the gunwales and working down all but guarantees rivulets of bleach flowing down the side of the hull and leaving vertical whitish stripes that are hellish difficult, if not impossible to disappear. We are experimenting with Danenberg’s sanding progression, rather than employing the 80-grit rough surface approach to prepping the bull for bleaching and staining. That progression from 60 through 80, 100, 120, 150, 180 and finally 220 grits leaves the surface silky smooth. That we have made so many additional passes with our 18” pneumatic flatboard sanders delivered an additional benefit. The surfaces is absolutely flat and should provide an excellent foundation for the varnishing to come, which is Danenberg’s core contention. We kept her wet for 16 hours, and then let her dry down until the moisture meter read 12%. Time to stain, yes? Not quite. The bleach wreaks havoc on the formerly silky smooth surface. The grain is raised and sometimes bleach residue presents in unpleasant, blotchy hues. The remedy? 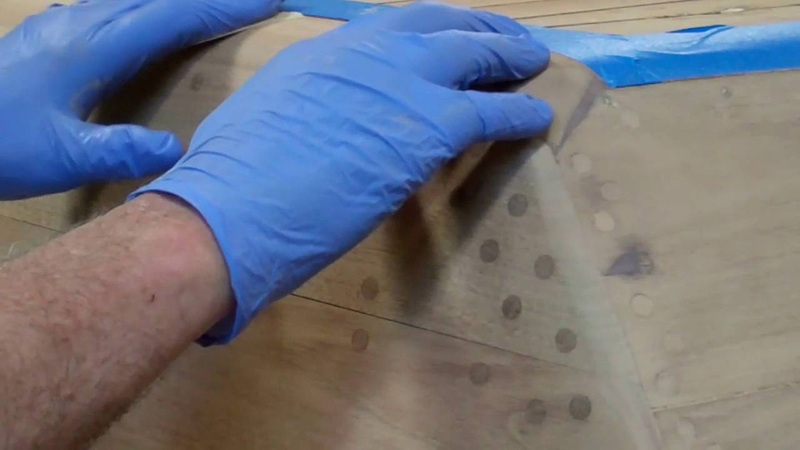 Don Latex or Nitrile gloves and grab a role of 320-grit, sticky-backed longboard sandpaper, and, yes, sand the entire hull, but this time by hand. Key here is using the lightest touch possible and knowing when it is time to move on. Let your fingers be your guide Even through the glove fabric you can feel when the surface is silky once again. Move on right then, or risk sanding through the approximately 1/32 – 1/16 inch of bleached wood. We follow sanding with vacuuming and then tacking the entire surface.